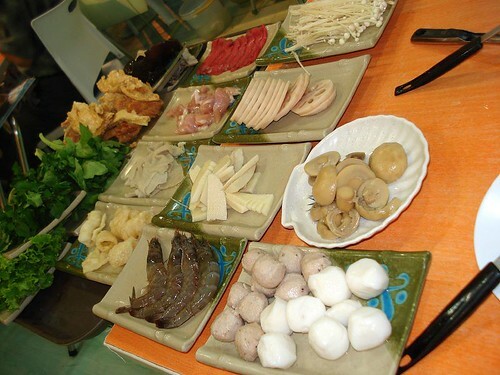 Steamboat Spread, originally uploaded by Camemberu. After a weekend of bad food in another country, we went to this cheery little steamboat place at Tanjong Katong Road called Paradise on Earth. I feel like I've hit the lottery. Hubby who normally loathes steamboat actually likes this place and would come back again (in fact, he doesn't want to go anywhere else!). Most of our experiences with steamboat have left us quite disappointed (that mala place at Liang Seah opposite Ah Chew desserts) and even horrified (some outdoor joint near Marine Parade NTUC with really bad hygiene). Here, at Paradise on Earth, the food not only looks and tastes fresh, it's really quite value-for-money. Very pleasing on both eye and wallet. About 60 items (meat, seafood, vegetables and dishes - click pics on right to see enlarged readable menus) plus dessert come free-flow with the buffet price. 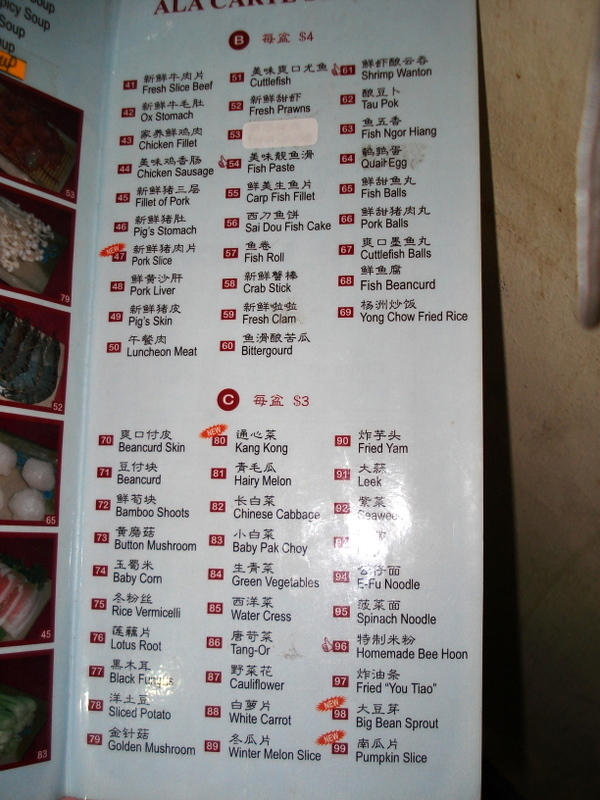 They also have a premium menu (house specialties) of about 30 items that you can order separately. 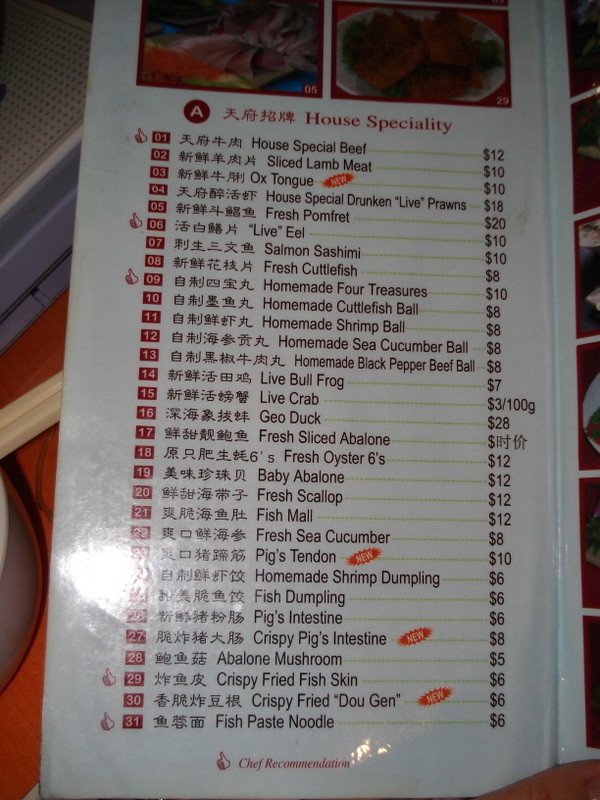 You won't be complaining about lack of variety here (got a sudden craving for live bull frogs and geoduck? no problem). Paradise On Earth, originally uploaded by Camemberu. They have about five soup choices (you can have two). They are well-known for their satay flavoured soup - we liked this better than their hot & spicy (mala style) soup. Others are fish head, dried scallop and tom yum. You must try the fried rice here. Looks like plain old Yangzhou fried rice but it's delicious - the first time I had it, I took three bowls! I like the sweet-sour-spicy dipping sauce too. Oh, they also serve you a nice plate of achar - pickled pineapple, carrots and cucumber (that will later appear as a $2 charge on your bill). However, there is no GST and no service charge at this place. Hurrah! Daily 11am - 3pm, 6pm - 11pm. Wow, thanks for your excellent recommendation. The food looks very fresh and value for money. It's indeed a "paradise on earth". Will definitely bring my family there for dinner this weekend. Hello, jus wanna ask.. do this shop provide free flow for drinks? and is it a "Eat All You Can" steamboat? I can't remember but drinks are likely separate. Yes, it's a buffet, all-you-can-eat steamboat. Oh and I think prices may have increased. Call beforehand to find out (and make reservations, it can get really packed). the ingredients are very fresh and the price is really reasonable. sad thing is luncheon meat (my all time favourite) is not on their buffet list. it is selling at $4 for a plate of 8 tiny pieces but i love them too much to give em a miss!! still, it's a great find and will definitely go back again to try other soup base. nonetheless chongqing hotpot is still my favouritest steamboat joint with their free flow of luncheon meat!!! Definitely good value for money but the Mala was SO TONGUE-INCINERATINGLY HOT that we ended up just cooking our food in the dried scallop stock! And in the end, went through jugs and jugs of lemon juice! The slice fish was fresh and smooth, prawn quite tasty but tiny... but the clams were the real hit (still alive and slithery when you chuck them in hot soup!). Would recommend staying away from the spinach noodle - it's just egg noodle in green dye! Definitely want to compare this with Chongqing at Tanglin Shopping Centre! Chongqing at Tanglinis also nice. The mala there is toned down, so hopefully it's not so hot for you guys! 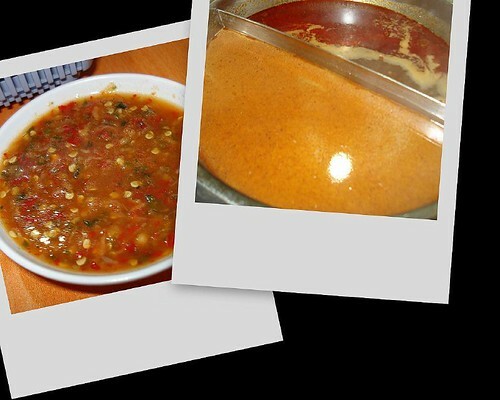 akeguin: actually the satay soup base is an acquired taste. I didn't like it when I first tried it. Only on second occasion, I grew to like it. I'm going to try this out tomorrow yippee!! Have one of my fav aunts coming down from NZ so I really want her to be impressed and happy. This looks like a great choice. Others have similar positive experiences, from what I've read online. Oh, it's $18.80 for buffet for adults on a weekday now. Hi Esther, glad to know you're headed there. I've been hankering for a nice steamboat myself. Wow the prices have increased again? I also noticed that they expanded and have a corner shop just a few units away. Generally I'm a bit wary when small operations like this expand, but hopefully they have things down pat by now. Headed down to the outlet at 200 Tanjong Katong last sat. Was looking forward to a fabulous dinner, but the service was a real let-down. The customers at our next table were so pissed off that they told the staff straight they will not return! What a show! The food were so-so, comparable to the many sprouting steamboat outlets available everywhere. Hi Anon, sorry to hear that it's gone downhill. I realise it's been more than two years since I ate there. Anyone else have a good steamboat place to recommend? i dun tink tis place is halal rite? Erm, nope, sorry, Speedemon. They serve pork products. Come to think of it, I don't know that many halal steamboats...hmm. Steamboat fans should try this one too. ZIWEITANG FOLK SOUP POT RESTAURANT. 滋味堂民间汤锅馆. their soup is tastier compared to Paradise on Earth. food quality same, environment is cleaner, more spacious. most of all, the staff there are all very friendly and prompt. i give up on Paradise oredi. Just had a really bad experience there even though I have been a real regular there for the past 4 years. Recently they introduced some soup bases for an extra charge of $5. As I tried the pig stomach soup previously, I really liked it and requested it again. But halfway through the dinner, the soup ran out, and instead of informing the waitresses or myself of it, the cooks just refilled the jug with chicken soup and insisted it was pig stomach soup. They even took a bowl back to try and have the cheek to insist it is pig organ soup just that it is diluted as they do not have time to boil it. Seriously, if I can't even tell the difference between the pig organ soup which I pay $5 for, and a chicken soup that was free, why will I even borther paying the extra? Totally dissapointed with the attitude of the staff there as well. Bad attitude and lousy service. Never go there again. do u know of any halal steamboat restaurant in SG?